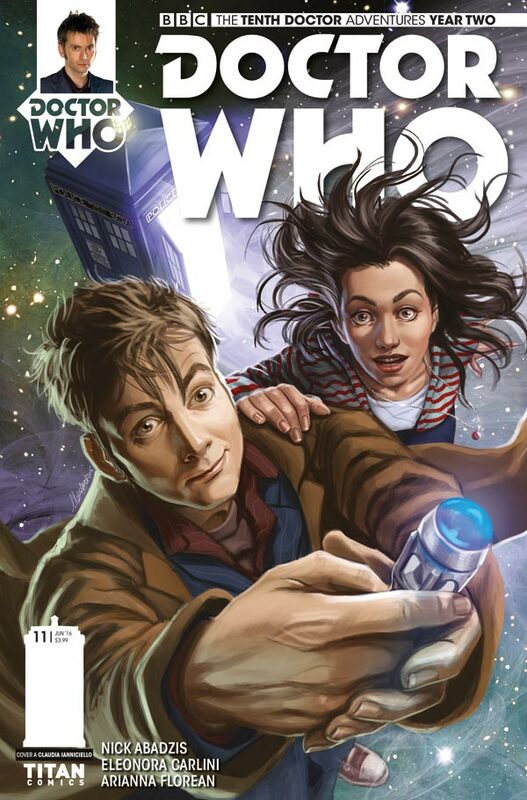 Titan Comics: Doctor Who - THE TENTH DOCTOR #2.11 Review | Warped Factor - Words in the Key of Geek. Yes, we’re in New Orleans in the age of jazz for this issue, and Cindy Wu is having herself a time-travel holiday fling with a smoking hot jazz trumpeter by the name of Roscoe Ruskin. Gabby Gonzalez is catching some genuine R&R time and loving the ease and the freeness of the city of jazz, while the Doctor, unnerved by the events that ended their last adventure and the dark Time Lord portents they revealed, is more or less sticking to the Tardis, brooding about the impending ‘end of songs’ he’s begun to fear. The villain of this particular piece is an archetype so perfectly fitted to the Who format it’s actually quite miraculous it’s never really been used in the on-screen show, and the effect the villain has on the musicians of New Orleans is both suitably odd and horrifying, and yet properly underpinned by a lot of classic Tenth Doctor gobbledegook science. So what we’ve got is a great set-up in a fabulously rich environment with a vibration all of its own, a simple but effective baddie, a raise in the stakes by the emotional involvement of one of our companions, a properly complex mystery surrounding the baddie, and a series of consequences that are both monstrous to imagine and simple to understand. That’s going to give you something pretty darned memorable. There’s also some respectable self-mining at work here – Nick Abadzis raising the possibility that what we’re dealing with here is somehow connected to the events on Wupatki related in an earlier story arc. Wupatki, for those who are less slavishly devoted to the Tenth Doctor comic-books than they should be, is a planet where conceptual beings called Shan’tee make themselves known through the medium of sound and especially music. The Doctor and Gabby battled the elegant concept of a musical virus that turned Shan’tee into ‘Nocturnes’ – essentially, killer songs. No, seriously, it worked really well at the time. Where that gets really interesting is in the question of where, in the Nocturnes’ timeline, this New Orleans adventure fits – if at all. There are some strong suggestions that perhaps, contrary to what we were lead to believe at the time, what we’re now seeing is the Genesis of the Nocturnes, or possibly the Genesis of the Nocturnes’ Big Bad Boss-Tune. Again, where this really works well is that it takes the Nocturnes and their complex, conceptual nature, and turns them into something real and tangible and beggaring about with New Orleans in the jazz age. What’s more, it takes what we learned of the Nocturnes before – especially their desire to translate themselves from conceptual to flesh and blood beings – and gives it some more… well, flesh and blood. There’s a great technique at work in Abadzis’ storytelling here – if you’re going to have two companions in the Tardis, why not, for once in the show’s history, give each of them half of the narrative burden, allowing us to see events from different angles, and with different takes on them. Speaking of satisfaction and plaudits, check out Georgia Sposito’s artwork here. It’s been one of the oddest points of weakness in the Tenth Doctor comic-books that Tennant’s Doctor, given his fairly classic handsomeness, has been so regularly difficult to properly capture in two dimensions. 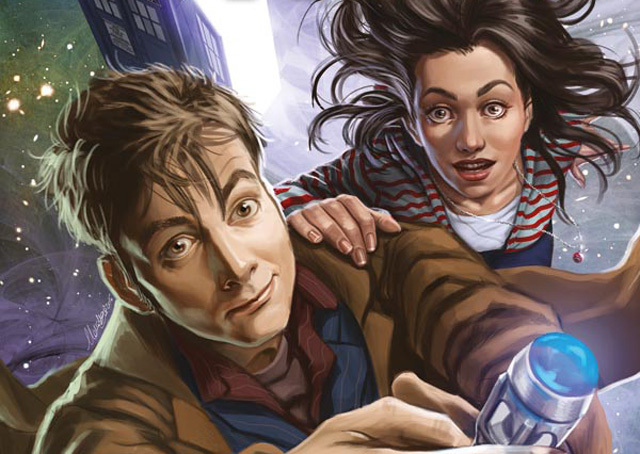 Sposito though appears not to have noticed this difficulty, and sets about rendering the Tenth Doctor in a believable, workmanlike way that recommends her work for future projects capturing difficult subjects. Her environments too have that pleasing combination of precision and seeming ease that add a textural reality to the world Abadzis conjures with his words. The colourist double-act of Arianna and Azzurra Florean are on form here too, giving New Orleans a watercolour loveliness that perfectly matches the mood Gabby describes – ‘I love this time. Love this space.’ The Floreans and Sposito together make you understand why she would, and give you an urge to investigate the place and the period further. There’s also some exceptional colourwork later in the issue when the Doctor and the baddie indulge in a spot of sonic battle. With Abadzis telling us everything we need to know about the world and Sposito rendering it with a precision that underlines its reality, what we have is a troupe of storytelling ‘musicians’ all delivering at the peak of their powers. In an underlining of the main theme, this issue is Doctor Who Does Jazz – and that’s no bad thing. Grab your hep cat hats and dance on down to your comic-book supplier of choice today – issue #2.11 will spirit you away with some cool horns, some hot jazz, and some superlative storytelling from four players at the top of their game.